That is the Left’s overall strategy, i.e. to sneak things through a step at a time. 2 examples … the progression of abortion from only a first trimester action to be made “valid” even after birth, and starting with Obamacare (and outright lies to sell it) to the ultimate goal of single payer Medicare. The left lacks the courage to stand up for the Green New Deal. They would rather pick away at our economic engine until they control all aspects of our economy. They must be stopped! This is a response to Jerry’s metcalf comment. They should give up.Global warring does not exist. The liberal are not giving in or up, They will use smaller bills like the Paycheck Fairness Act. They want the general public to be poorer as that makes them easier to control. That’s also what the “No Border fence” is all about and the Gun control laws. Democrats will not give up and do what is right. The will continue to push back door bills that seek to take away more of our freedom and punish business. These little victories with large consequences are just part of the Democrats long term strategy. They will never stop. It is death by a thousand cuts. Democrats thought they were on a roll, put all their dreams in one big bill. Usually they put a lot of small bills up and then demand bipartisanship, and squishy RINOs go for a piecemeal surrender. They will return to the old way, and we will need to keep pressure on our softheaded (or easily bought) bipartisans. Trump should be looking for primary opponents for our RINOs and never-Trumpers. If it’s unfair as a whole or not thoroughly thought thru, as this Act has been, then you can be sure that the Democrats are not thinking about the people it will affect – only about how they’ll “look”. It’s one of those Pelosi’s Acts: Pass the Bill, then read it ! Bunch of hypocrites! Occasionally, the Marxists throw a down the field pass like the Green New Deal. If it fails, they go back to Incrementalism, one first down at a time. They never give up, neither should we. Democrats in general are asenine losers. They want to ruin this country. They need to be voted out and shipped back to their country of origin. Pelosi and Schumer are idiots!!! They deserve no respect. The left will ALWAYS attempt to push us further and further leftward. Duh. I agree with Thomas Wright. They will not give up. The liberals’ main objective is to control us and grab everything for themselves. Either they think we are stupid or want to convince the general public we need help from them because their intelligence is superior to ours. Slowly but surely they want to fundamentally change our country ,just as Obama wanted. The patriots of this country are against it. We need to vote in constitutionalists to our house and Senate and stack the supreme court with the same. Trump is doing a good job but ” MUST ” seal the border. I see what’s happening and it’s not right!! I fear for my son may not have a great country to grow up in as I did. These ideological charlatans must NEVER be allowed to put their hands on the throttle or the steering wheel in our government again, ever! The Obama Criminal Enterprise has manufactured such a disaster in its short life at the Federal level that the wreckage stands as a bleak monument to the left’s warped vision. People, we need to clean out the education system which is creating these ignorant masses. You can start with your local public education system. Get involved and call out the hypocrisy being spoon fed to our children! So what the hell are we going to do to keep the planet from burning up and making the future of my grands a living hell?? ?I demand that we take some action.The earth doesn’t favor anybody. The left is relentless. We can’t rest for a second because the fox will find another way to the chicken coop. The left are just a bunch of want-to-be’s. They have empty buckets sitting on top of their shoulders. They will keep chipping away at our economy and try to make it an impossible economy to maintain. THE DEMS ARE CONTRARY TO EVERYTHING GOOD FOR THE REPUBLIC!! They will try everything and anything. Get rid of Soros and his cohorts. 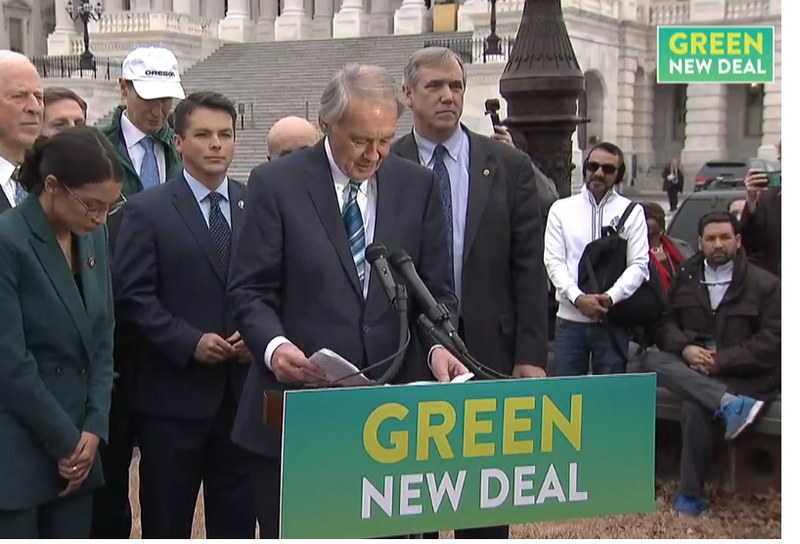 The green new deal is a complete fraud. Climate change is here and may very well be another “Little Ice Age.” The sun is the quietest in two centuries. I am a retired atmospheric scientist (NASA) and have researched the climate change issue for over 25 years. They are only waiting until they win enough seats in Congress and the Presidency to pass the “Green Raw Deal”, sorry, I mean the “Green New Deal”. the fair pay has been around for decades. I started to work in 1964 and it was there then. If you do the same job; then you deserve the same pay. AMEN. if not; you are discriminating. My company did fair pay. Our problem was bidding in on the job. if a man and women bid in, the man normally got the job. Then it changed. Thank goodness. I retired; the man left or was fired. Cowardly Dems voted “present” because it was a public vote, for all to see. They won’t commit until they see how it plays back home. But they’re continuing to support it in order to appease the Radical Left. They must be voted out of office. The Democratic Party is all about the consolidation of power at the Federal level with themselves at the helm. They represent a contentious threat to our liberties. They must be defeated. You bet Democrats will not give up. Hatred of Trump, Republicans, and Conservatives drives them. It is their religion. The Democrats will do anything for a vote even, if it is bad for the nation. Let’s hope they are all voted out of office now that we see what the propose. Then they don’t even vote for what they demand in the press. Disgusting! I have one question for the “Green New Deal” advocates. Under those “free electricity” windmills, whose going to pick up all the dead birds? They are Snickers all of them even Joe Biden they want control of everything US by taking everything from us & our economy, They will NEVER give up lose or win will be worst trouble for all the World not just us.